Denise and I attended the Springfield NAACP Martin Luther King Jr March and Celebration this morning. The marchers gathered in the MediaCom Ice Park beforehand. Making our way through the crowd I saw Steve Pokin a friend and reporter for the Springfield News-Leader. I respect Steve so much and thoroughly enjoy his columns. I too grew up in church. My father, both grand-fathers, one great-grandfather, three uncles were preachers. Preaching/Pastoring felt a bit like a family-business. “We must meet hate with love” were his words then. I want them to be my words now. Denise and I weren’t alone this morning. We stood and marched with a diverse group of people – diverse in color, income, religion – but united in love and the desire for justice. * ”The ultimate tragedy is not the oppression and cruely by the bad people but the silence over that by the good people,” Martin Luther King, Jr.
Come ye that love the Lord, and let your joys be known. Join in a song with sweet accord, Join in a song with sweet accord. We’re marching upward to Zion, the beautiful city of God. Then let our songs abound and every tear be dry. We’re marching through Immanuel’s ground. To fairer worlds on high, to fairer worlds on high. In June 1956 (the month and year of my birth), a federal district court ruled bus segregation unconstitutional; the Supreme Court affirmed the ruling in November 1956. It just blows my mind that it took our court system to right such a wrong as racial segregation. The Montgomery Improvement Association sent the following letter outlining how people should conduct themselves on the newly integrated city bus system. Sound familiar? Have you ever read or heard anything like that? Go back and read it again. Quite the contrast to what we see and hear today. Let’s continue in the spirit in which the work was done. 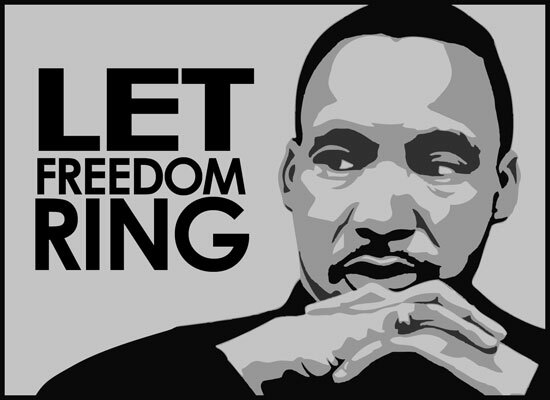 Today is the day we have set aside to give national recognition and much deserved honor to Martin Luther King Jr. The battle for civil rights was fought on many fronts. Dr. King appealed to us as Americans, taking us back to our founding documents which declare the “self-evident truths that all men are created equal and endowed by their Creator with certain unalienable rights.” Politically, Americans had to choose between being an American as defined by the Constitution and Declaration of Independence or being racist. The civil rights movement was a spiritual movement. Dr. King was also Rev. King. On this point, the matter gets more complicated. You wouldn’t think so. To our minds, slavery, Jim Crow laws, segregation, racism, prejudice just don’t fit with the Christian life. It was not always so. Growing up in Little Rock, I am well aware of the stain of a segregation mentality. Growing up a Southern Baptist, I was not aware until sitting in a Baptist History class in a Southern Baptist college that the founding of the SBC was all about slavery. Foreshadowing the Civil War, white Baptists in the South separated from their northern counterparts on May 10, 1845, and formed the Southern Baptist Convention in order to defend the South’s practice of and dependency on slavery. Slavery was biblical. Abolition, therefore, was sinful. Wow. Such a view, a view which its holder claims to be grounded in Scripture, staggers my mind. But he wasn’t alone. All you history buffs may know Mark A. Noll. He authored, The Civil War as a Theological Crisis. Instructive for us in regard to Bible interpretation and application. The book is a case study in hermeneutics. It seems that pro-slavery pastors and Christians appealed to specific Scripture verses in support of their position, while anti-slavery pastors and Christians appealed to the general Biblical principles of justice, mercy, and love to support theirs. The problem was, the pro-slavery folks had a lot going for them in the way of proof-texts (Exodus 21:20-21; Deuteronomy 20:10-11; 1 Corinthians 7:20,21; Ephesians 6:5; Colossians 3:22; 1 Timothy 6:1 to name a few). The same verses and interpretation used to support slavery were used to support segregation a century after emancipation. What then was the Biblical basis for Rev. King’s call to unity and equality? What’s the Biblical basis for us making the same call? Noll’s book is not just a look at history. It’s a look at ourselves and how we use the Bible.